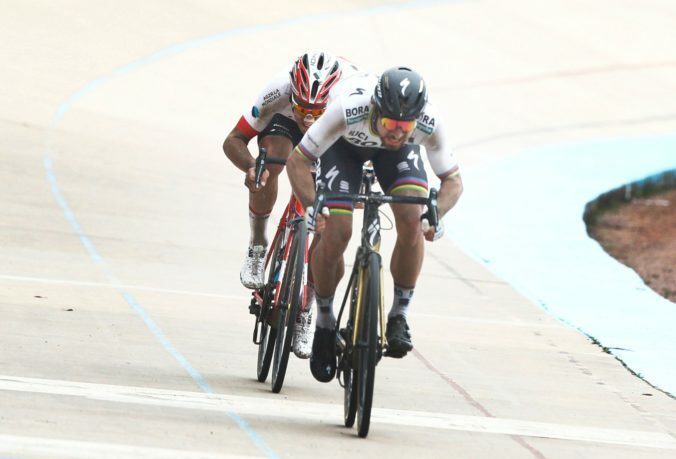 Slovakia's Peter Sagan right, sprints to win the 116th edition of the Paris-Roubaix cycling classic, a 257,5 kilometer (160 mile) one day race, with about 20 per cent of the distance run on cobblestones, at the velodrome in Roubaix, northern France, on Sunday, April 8, 2018. Switzerland's Silvan Dillier finishes second. (AP Photo/Michel Spingler) Foto: SITA/AP.